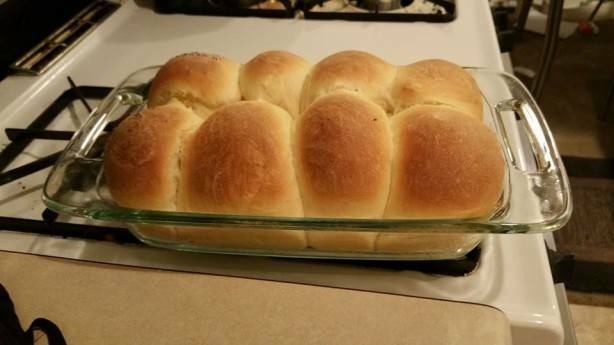 This recipe is easy and yields soft, slightly sweet rolls and loaves. Beat the eggs. Add the pineapple juice, sugar, ginger, vanilla, and butter. Place 3 cups of flour in a large bowl. Stir in the egg mixture until well-combined. Sprinkle in the yeast, one packet at a time, and mix. Add the remaining 3 cups of flour and mix in . Blending with a spoon will be hard, so you may have to use your hands. Make sure it is thoroughly combined. Cover the bowl with a cloth and set in a warm place to rise for 1 hour. Remove from the bowl and knead in 1/2 cup flour. Knead about 10 times. Divide into three equal parts. Place in greased and floured loaf pans or shape into rolls. Cover and place in a warm place to rise for 1 hour.